This wasn't very sweet but it was rich as cheesecakes tend to be. I recommend cutting into small pieces. Preheat the oven to 300 degrees F. Line a 9-inch square pan with foil and lightly spray with nonstick cooking spray. Prepare the brownie: Melt the chocolate and butter together in the top of a double boiler placed over simmering water. Whisk until smooth and combined. Let mixture cool for 5 minutes. Place the sugar and eggs in a mixing bowl and beat on medium-high speed until pale yellow, 2 minutes. Scrape the bowl with a rubber spatula. Add the flour on low speed and mix for 5 seconds. Scrape the bowl. Add the cooled chocolate mixture on low speed and blend until mixed, 15 seconds, stopping the mixer once to scrape the bowl. Do not overmix. Spread the batter evenly in the prepared pan and place the pan in the freezer for 10 minutes. Do not skip this step. Meanwhile, prepare the cheesecake topping: Place all the cheesecake ingredients except mini chocolate chips in a food processor and process until smooth, 1 minute. Stop the machine once during the process to scrape the bowl. Add mini chocolate chips, if using. Remove the pan from the freezer. 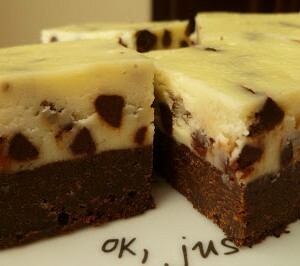 Carefully spoon the cheesecake mixture over the brownie layer, and, using a spatula, spread it over the brownie in an even layer, being careful not to mix the two layers together. Bake on the center rack of the oven until the top is set and the center is just about level with the edges, 1 hour and 5 to 10 minutes. Cool the brownies in the pan for 30 minutes. Lift out of the pan using the foil ends. Let cool completely before cutting into squares with a sharp knife. Wipe the knife between cuts with a damp paper towel. If not consuming immediately, cover tightly with plastic wrap and refrigerate or freeze. The key to baking cheesecakes is to bake at a low temperature to cook the cheesecake layer slowly and properly to keep the creamy texture it's supposed to have.